Place the cleaned mussels into a large pan with the wine. Cover and cook over a fierce heat, shaking the pan a few times, until the mussels open. This takes about 5 minutes. 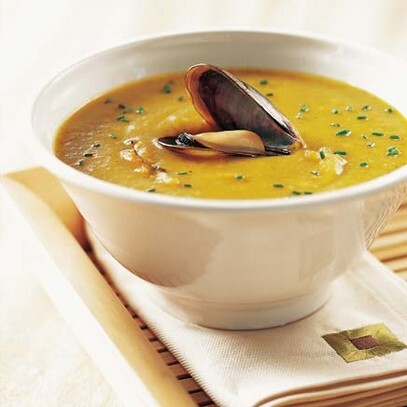 Place a colander over a bowl and tip out the mussels, taking care not to spill any of the liquid. Reserve a few whole ones for a garnish, shell the rest. Melt the butter in the same pan and stir in the curry powder, Masala Spice, leeks and potatoes. Cook gently for 5 minutes, stirring a couple of times. Strain the mussel liquid through a fine sieve into the pan with the vegetables, add the bay leaf, water, Liquid Fish Stock and Lemon & Black Pepper Seasoning. Bring to the boil. Simmer for about 35-40 minutes. Remove from heat and liquidise. Stir the mussel meat into the liquidised soup. Reheat and check the seasoning before serving. Serve with a sprinkling of chives, freshly ground black pepper and top with a whole mussel.